Nicholas Blake, A Question of Proof — This is the first Nigel Strangeways mystery, which I need to read before the second one, which I already own. Elizabeth Daly, Evidence of Things Seen — I like the look of this vintage mystery (first published in 1943), which seems to involve murder and ghosts. Unfortunately, it appears to be the middle of a series, but I’m hoping it can stand on its own! Theresa Tomlinson, The Forestwife Trilogy — I’ve been wanting to read these books for FOREVER, but I believe they’re out of print; either that, or they’re just REALLY hard to find! Helen Humphreys, Coventry — I love a good World War II novel, and I’ve heard good things about this one. Celine Kiernan, The Poison Throne — I THINK this might already be on my TBR list? Not sure, but I couldn’t resist the cover and the interesting summary! I’m even prepared to overlook the fact that the heroine’s name is Wynter. Phil & Kaja Foglio, Agatha H. and the Airship City — This one looks like a fun steampunk romp, and the tagline totally sold me: “Adventure! Romance! Mad Science!” I mean, right? Poul Anderson, Three Hearts and Three Lions — Ever since The High Crusade, I’m always on the lookout for cheap Poul Anderson! Martha Wells, The Wizard Hunters; The Ships of Air; The Gate of Gods — At some point I read and liked a Martha Wells book, and this entire trilogy was 75 cents, so why not? E.C. Bentley, Trent’s Last Case — I’m pretty sure I read a good review of this recently, and I’m always in the market for a good mystery! Despite its title, this is actually the FIRST Philip Trent case. P.D. James, Talking About Detective Fiction — I actually haven’t been impressed with the few P.D. James books I’ve read, but she is a big name in the mystery genre, and I have no doubt she has some interesting and articulate things to say about it. 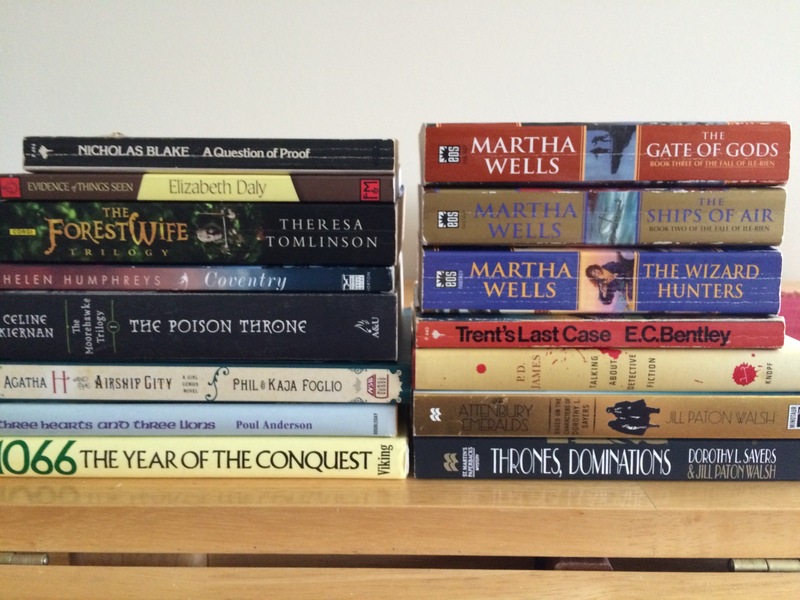 Dorothy L. Sayers & Jill Paton Walsh, Thrones, Dominations; The Attenbury Emeralds — I’m slowly building my collection of the Lord Peter Wimsey (and Harriet Vane) novels, and even though these weren’t written entirely by Sayers, I think they still count!